Inventory management is the art of making in-demand products available when customers want them while keeping inventory costs low. For companies that sell goods and services, inventory (or stock) is rightfully called the lifeblood of the business. A healthy inventory flow enables sale closings, customer shipments, and productive work for employees. Without this flow, the business dies. It should be no surprise to find that in many industries, a firm's financial performance and position depend heavily on the firm's ability to manage inventory effectively and efficiently. Firstly, inventoryrefers primarily to goods, raw materials, and other tangible items that a company holds, intended ultimately for sale. The rest of this article assumes that definition. Secondly, as a verb, inventory means to count or list units of a resource on hand. A hotel business, for instance, might inventory the contents of a hotel room when a guest departs as a check against loss. Thirdly, inventory also refers to a listing for a specific purpose. A hospital might create an "inventory" (list) of medical equipment and supplies that should always be on hand in an operating room. Companies that hold and sell inventory face a double challenge. On the one hand, in-demand products must be available when customers are ready to buy. On the other hand, acquiring and managing stock to meet this objective can be very costly (see the section on costs below). As a result, many firms give substantial and constant attention to finding ways to improve and optimize stock management. The goal is to do this while minimizing costs at the same time. First, defining inventory and explaining the inventory role in business models for firms in manufacturing, services industries, and retail business. Second, how firms value and report inventory and inventory changes. THird, how firms measure inventory performance, with activity and efficiency metrics such as Inventory Turns andDays Sales in Inventory. Fourth, tactics businesses use for controlling and minimizing inventory management costs. Fifth, methods for optimizing inventory ordering. What are the major categories of inventory? How do firms account for inventory assets? Inventory Valuation. Inventory Value for Reporting Purposes. What determines the original inventory valuation? How are inventory values updated? FIFO and LIFO conventions: What are the differences? How do firms write down assets when inventory loses value? How do firms report inventory values? Days sales in inventory DSI. Where are the significant costs in acquiring and managing inventory? What does "taking inventory" mean? How do firms forecast and order inventory? How do firms minimize and avoid inventory costs? For more on inventory performance metrics see the articles Activity-Efficiency Metrics and Liquidity Metrics. For more on the role of inventories on the Balance sheet, see Balance Sheet. The article Write Off illustrates accounting transactions when inventories lose value. Business inventory falls typically into two classes, merchandise inventory and manufacturing inventory. Note; however, several different kinds of stock fit neither of those categories. Merchants who buy finished goods and then sell them in that form deal primarily with merchandise inventory. Retail shops and food stores, for instance, acquire, hold, and sell merchandise stock. Merchants earn margin on these goods by making them available when and where customers want them. The merchant's role may include packaging, shipping, delivery, or minor assembly, but these activities are not "manufacturing." The term merchandise stock refers only to inventory the merchant owns. As such, it is a company asset, to be valued and accounted for at the end of each accounting period. Merchandise held for sale on consignment but belonging to someone else is not part of the merchant's inventory. Companies that buy raw materials or necessary parts, and then manufacture finished goods from them usually classify inventory as either raw materials, work in progress, or "finished goods." Raw materials include assets in the same form suppliers provide them. For an oil production company, raw materials include natural crude oil. For a metal stamping company that produces automobile parts, raw materials include unworked sheet metal as acquired from the supplier. Finished goods include goods the company produced from raw materials, now ready to sell and ship. For the automobile company, finished vehicles not yet sold or sent to dealers are finished goods stock. Note that one firm's finished goods can be another firm's raw materials. Flat sheets of steel may be finished goods for the steel company, but raw materials for the metal stamping company. Hotels refer to unsold guest rooms for a given night as inventory. Airlines identify unsold seats in each ticket class, for each flight, each day, as inventory. These assets become worthless if they do not sell by their designated days. As a result, hotels and airlines sometimes offer last-minute price discounts, trying to recover at least some value instead of none. Repair shops and other service firms maintain spare parts stock. Firms that repair automobiles, appliances, shoes, or watches, for instance, either carry parts stock themselves or else work closely with suppliers who can supply them quickly on short notice. Repair shops typically make some margin on "parts" themselves, but these do not qualify as merchandise or finished goods. The customer may or may not receive a bill summarizing individual "parts" and "labor" charges. Medical clinics, hair salons, and cleaning services usually maintain a supplies stock. They do not sell these items directly to customers as merchandise, because they use them to deliver services. Sellers of electronic books (ebooks) carry a product title inventory. They hold master copies of each title, from which they produce and ship any number of individual customer copies. For these vendors, the stock is not physical goods but instead a collection of intellectual property usage rights, which they sell to individual customers. Non-physical inventories of this kind can also include other "electronic" products that ship by internet download. Examples include software, recorded music and videos, and documents in PDF format. Here also, the seller's "inventory" is not physical property, but instead, a set of intellectual property usage rights. For non-physical goods of this kind, most of the other major cost areas with traditional physical stock are also absent, such as storage costs and handling costs. And, such inventory is never used up nor out of stock. It loses value, however, when it becomes obsolete, or when competitive market prices change. On the Balance sheet, Inventories appears on the Balance sheet as assets. As a result, they impact asset-related metrics such as Total asset turnover and Return on total assets. Note that inventories almost always appear under "Current assets" because firms consider them relatively liquid assets. The designation means these assets will, or could, convert to cash in the near term. As current assets, they also contribute to liquidity metrics such as Working capital and Current Ratio. And, their impact on these metrics can be substantial where they account for a large part of the firm's asset base. In some manufacturing firms, such as Cummins Engine, for example, inventories account for 18%-25% of the asset structure. How Do Firms Value Inventory Assets? What Determines Original Inventory Value? Historical cost is the total of all initial direct and indirect costs of acquiring the stock and bringing it in-house. Most assets including inventories are at first valued at historical prices. Market price cannot be higher than the estimated selling price, minus selling expenses. Selling price less selling costs is net realizable value. This value is the ceiling of permissible market values. Market price cannot be lower than net realizable value minus an average profit margin. This price is the floor of permissible market values. In other words, the stock value is the historical cost if that is lower than the market value "floor." Otherwise, its value is whichever is lower: market value ceiling or replacement cost. How Do Firms Update Inventory Values? Total inventory value typically changes more or less continuously, as firms stock new items and either sell or lose existing stock. The market value of individual items in stock also changes over time, for instance, when inventory items spoil or become obsolete. Note that cost of goods sold (COGS) sometimes appears as a stand-in for stock used up during an accounting period (see the inventory turns metric, below, for instance). This value is appropriate especially when a company turns raw materials into work in progress and then finished goods. "Cost of goods sold" reflects the direct and indirect labor costs and materials costs used to bring stock from one stage to the next. As a result, COGS represents the total historical "cost" of these assets. LIFO and FIFO Conventions: How Do They Differ? Firstly, units in stock are interchangeable. One barrel of crude oil as raw materials is probably interchangeable with any other barrel of the same kind. One sealed can of peas in finished goods may be interchangeable with thousands of others in stock. Secondly, the costs of acquiring units in stock are changing over time. A firm may purchase oil as raw materials in January at $85 / barrel. In June, the same barrel may cost $90, and another barrel may cost $98 in December. Similarly, a can of peas may have a COGS of $1.00 in January, $1.10 in February, and $1.50 in March. January, 75 cans added, @ $1.00. February, 125 cans added, @$1.10. March, 100 cans added, @$1.50. Suppose that a total of 60 cans sell from inventory during these three months. The accounting question in such cases then is this: What was COGS for the 60 units that left stock? Would that be January's COGS or another month's COGS? With interchangeable units and changing price conditions, companies can choose any one of three approaches to value inventory. After selecting a method for the first reporting period, however, tax authorities do not make it easy to change the plan in subsequent periods. Under FIFO, as items leave inventory, the accountant proceeds as though the single unit in stock for the longest time goes first. And, the next to move has the value of the item on hand second-longest, and so on. Which costing approach should a company choose? Remember that once a firm chooses a costing method, tax authorities do not make it easy to change. When costs are rising, LIFO maximizes COGS and therefore minimizes the total value of the remaining items. A higher COGS under LIFO leads to lower reported income and lower taxes. When costs are rising, FIFO minimizes COGS and thus maximizes the total value of remaining items. A lower COGS under FIFO leads to higher reported income and higher taxes. Note that International Financial Reporting Standards (IFRS) do not allow the use of LIFO in many countries. Regardless of which accounting convention is in use, FIFO, in fact, describes the actual flow of inventory in most companies. Few companies sell newer items before selling older stock they are holding. Many companies choose the Average cost method instead of either LIFO or FIFO, believing the average provides a more accurate measure of true stock costs during the period. In December 2012, Research in Motion (RIM) of Canada took a write-down of $485 million on its inventory of unsold Blackberry Playbook tablet computers. This act was an unavoidable recognition by RIM that the tablets in stock would never bring enough sales revenues to earn their original Balance sheet value. In this case, the realizable market value of the tablets held dropped below the company's COGS. How Does Inventory Lose Value? Market value may fall due to competitors actions or lack of customer demand. Stock suffers spoilage or damage. Goods that perish, such as foods or flowers, for instance, have by nature a short "shelf life." Shelf life becomes even shorter with inadequate storage and handling. Disasters such as a warehouse fire, or a rail accident during shipping can drastically reduce the value of all classes of goods. Items become obsolete or out of date. Designer fashion clothing commands a high market value only for a relatively short "season" of a few weeks or several months at most. Many consumer technology products can succeed with high market prices for a few months at most. Magazines and other dated print media may have high value for no more than a few days. Inventory is subject to theft. Theft can occur in the form of a warehouse burglary or store burglary, but also from pilferage by the company's employees, by shippers, or by shoplifters. This kind of stock loss is common, and in some cases immune to complete eradication. As a result, many companies create accounts for "leakage" or "shrinkage," and regularly report an expense item under one of these names. When inventory loss or devaluation due to one of these causes is relatively small, the accountant can incorporate the lost into COGS. When the stock loses substantial value, however, (as in the Case of Research in Motion's 2012 write-down), the loss impacts the company's period-end Balance sheet and Income statement. With a write-down, however, a Balance sheet asset account receives a credit transaction (CR) for the loss (in double-entry accounting, a CR transaction reduces the asset account balance). At the same time, the firm takes an equal and offsetting debit (DR) for an Income statement Expense account (a DR transaction increases an expense account balance). The expense item is listed as an operating expense, moreover, thereby reducing reported operating profit. The only consolation to the reporting company is that lowering operating income also reduces the company's tax liability. Why are stock write-downs reported as operating expenses and not as extraordinary expense items? By GAAP standards and tax laws almost everywhere, expenditure qualifies as "extraordinary" only if it is not expected or usual in the company's core line of business. Even though losses such as RIM's 2012 write-down are infrequent, they are considered expectable in the company's business. How Do Firms Report Inventory Value? Exhibit 1 below shows a simple Balance sheet report for inventory. Here, "Inventories" is a single line item under Balance sheet Current assets. For companies where several different stock categories represent a substantial portion of the company's asset structure, it may be helpful to report several kinds of stock separately. 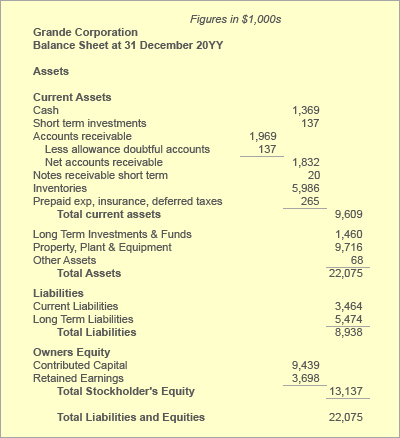 Instead of the single line in the example above, the Balance sheet may show categories as they appear in Exhibit 2, below. Exhibit 2.Instead of a single line for "Inventories" as in Exhibit 1, above, the Balance sheet may instead show separate lines for different inventory categories. Businesses acquire assets expecting them to produce returns. And, inventory assets that sit idle for long periods of time are not working efficiently and may not be justifying their presence in the asset base. These assets "work" by getting off the shelves and turning into sales revenues. Company owners and officers have a keen interest, therefore, in metrics that show how well inventory assets are performing. Firms measure inventory performance with "activity and efficiency" metrics. Three of the most frequently used measures for this purpose are (1) Inventory turns, (2) Days sales in inventory, DSI and (3) Days Inventory outstanding DIO. Inventory turns per year is a measure of liquidity, that is, how efficiently these assets are turning into cash. This metric measures Inventory turns by comparing total net sales from the Income statement to the value of the stock from the Balance sheet. The Balance sheet figures, of course, represent stock levels at period-end. When used this way, the period-end total is a stand-in for the typical or average total for the year, at least to create the turns metric. However, if the year-end figure is substantially different from the average on hand throughout the period, the analyst may view the actual "average" as the more appropriate figure. Note especially that example calculations for inventory turn use data from the firm's Income statement (Exhibit 3, below) and Balance sheet (Exhibit 1, above). Analysts calculate Inventory turn metrics in two different ways. Firstly, from Net sales revenues, and secondly, from Cost of goods sold (COGS). The second method using COGS will generally be lower or more conservative than Method 1 using Net Sales. Note also, that inventory "average value" is sometimes used in place of" total inventories." The latter represents the end of period Balance sheet figure. When there are substantial seasonal fluctuations, however, some analysts view the period average value as the more appropriate representation. These assets represent an investment by the company. While the investment sits in stock, the company cannot use the invested funds for other purposes. The stock may require expensive storage space and handling. As mentioned above, some kinds of goods lose value quickly: Food, plant, and animal products may be subject to spoilage. Technology products may become outdated and obsolete. Fashion products may hold value only for a short season. Maintaining a high turn rate for products with a brief "shelf life" is critical. On the other hand, turn rates may be too high if shortages interfere with the company's ability to maintain manufacturing or production schedules, provide warranty service, expand into new markets, or otherwise meet customer needs. In most cases, therefore, the optimal stock levels and optimal turn rates represent a tradeoff between storage and handling costs, on the one hand, and the negative business impact of insufficient stock on the other. The difference between "good" and "poor" turn metrics varies widely from industry to industry, and even between good companies in the same industry. A turn rate that is substantially below industry average may signal a severe problem in production or sales. For a specific company, turn rates should be compared from year to year, to track changes in efficiency. The Days sales in inventory DSI metric (or average turnover period, or days inventory outstanding) metric carries the same information as the Inventory turns metric (above). Whereas "turns" is a rate, the DSI metric sends the same message, expressed as "Days per turn." Note that the DSI metric is also called Average turnover period. Inventory turns, and DSI present the same information. As a result, the rules of thumb for "Inventory turns" above also apply to DSI results. "Turns" figures that are very high or very low may be indicators of inventory management problems. The same is true for DSI figures. The firm may use either metric (Turns or DSI) to set inventory performance targets. When comparing days sales in inventory metrics, however, be sure that all values refer to the same number of days per year. DSI is sometimes computed with 365 days and sometimes 360 days. The Days inventory outstanding DIO Metric is, in fact, another version of the Average turnover period DSI metric, from the previous section. Note that both DSI and DIO derive from a calculated Inventory turns figure. The only differences between DSI and DIO have to do with the method used to obtain Inventory turns. Note, that there are two commonly used approaches to calculating inventory turns per year (as shown above). One "turns" metric represents Net sales revenues divided by inventory value, while the other uses Cost of goods sold divided by inventory value. With the latter approach to obtaining "turns," the DSI metric is more likely to be called instead Days inventory outstanding, or DIO. Recall that Inventory turns based on COGS is almost always more conservative than "turns" based on Net sales. As a result, DIO is likely to be higher than the DSI metrics for the same inventory. DIO, or Average turnover period. DIO, calculated this way is one of the three components of the liquidity metric, Cash conversion cycle (CCC), illustrated in the liquidity metrics pages. The two other CCC components are other efficiency metrics, Days sales outstanding (DSO) and Days payable outstanding (DPO). The metrics Inventory turns, DSI, and DIO all present the same information. As a result, the "Inventory turns" rules of thumb above apply equally to DIO and DSI results. "Turns" figures that are very high or very low may be indicators of inventory management problems. The same is true for DSI and DIO figures. The firm may use any of these metrics (Turns, DSI, or DIO) to set inventory performance targets. When comparing days sales in inventory metrics, however, be sure that all values refer to the same number of days per year. Some The metric is sometimes computed with 365 days and sometimes 360 days. Exhibit 3 below is an Example Income Statement providing input data for Inventory performance metrics. Exhibit 3. Example Income statement with data for Inventory metrics. Other data for these metrics appear on the Balance sheet examples in Exhibit 1 and Exhibit 2 above. What Are Important Objectives For Inventory Management? Secondly, reducing and minimizing inventory costs. Where Are the Largest Costs in Inventory Acquisition and Management? As targets for minimization, costs for physical inventories are usually identified and managed in several categories. A simple review of the types listed here suggests that cost control and product availability both require that firms plan resources and processes as a single integrated system. These inventory costs fall into four categories: (1) Procurement costs, (2) Carrying costs, (3) Cost of capital, and (4) Loss or Devaluation. Is Inventory Management Completely Automated? What Does Taking Inventory Mean? Bar-code and other on-the-spot scanning technologies now make tracking easy and relatively sure—if and only if owners apply monitor rigorously when inventory consists of discrete tangible units or merchandise, finished goods, work in progress, or raw materials. The objective is to provide management at all times with immediate information on each unit's arrival date, storage location, cost, condition, and perhaps other data. Accordingly, each arriving new unit is "tagged" and scanned with one or more numbers, with a tag that subject to optical scanning (such as a barcode) or an electronic scanning technology (such as a radio frequency identification tag, RFID). The numbers may include a stock keeping unit number(SKU), a unique item serial number, a universal price code number (UPC number), or (in the case of books and other published media) an International Standard Book Number (ISBN). Each item (or each case, crate or box) is then scanned or "read" when handling the item, such as when moving it from a storage shelf to a customer shipping area. The final scanning for an item occurs typically when the business sells and ships it to a customer. The departure scan signals the system software to adjust the inventory account downward, and then passes the departure and sale information to other software systems that track shipping, update the bookkeeping and accounting system, update the customer database—and update the ordering system. So-called point-of-sale barcode readers and RFID readers make possible this kind of "cradle to grave" inventory tracking even in retail establishments such as food stores, bookstores, and hardware stores, where a single customer purchase may include many relatively small items. In many settings, automatic systems cannot track inventory with 100% accuracy. Therefore, many firms that own and handle inventory must conduct a physical inspection from time to time, at least at the close of each accounting period. Most people know the situation where they find a retail business suddenly "closed for inventory" on a business day. And, when this occurs, employees are seen inside, in the aisles with clipboards or barcode readers, physically identifying and counting every item on the shelves. A physical inspection in a warehouse is similarly labor-intensive. When do Firms Need Physical Inspection? Physical inspection is necessary when management believes that automatic systems are undercounting. Automatic tracking systems do not overcount unless the same item is scanned more than once, and then only if stock items do not have individual identification such as serial numbers. Inventory sustains loss through theft. Inventory theft is described variously, as pilferage, shrinkage, leakage, or shoplifting. Firms must order new inventory to replenish what they use up. Those who place the order try to order enough, soon enough, to ensure that goods are always on hand to meet customer demand or manufacturing needs. At the same time, however, they try to avoid ordering too much or ordering too soon. They do so because such orders result in excess stock on hand, which brings extra storage and handling costs. In situations where inventory usage is regular and predictable, managers can find the optimal times and amounts to reorder rather easily. Ordering in these cases typically involves a well known mathematical model, the Economic order quantity EOQ model. This rate is the number of units used up (e.g., sold) per day. This timespan is the number of days between placing and receiving the order for new inventory. This demand is the number of units that will leave inventory during order lead time. Lead time demand = Daily usage rate * Order lead time. Safety stock refers to units ordered in addition to lead time demand. These provide a safety factor, to ensure availability in case lead time demand is, in fact, higher than forecast. For more on these considerations, see the discussion below on safety stock. Therefore, the firm should replenish with an order when the current inventory level falls to 500 units. How many units should the firm order? The economic order quantity model EOQ provides the answer. The EOQ model finds the order quantity that minimizes the so-called total relevant cost—the total cost of placing orders and holding goods. The EOQ model finds this quantity by analyzing several interacting factors in using and ordering inventory. These factors are as follows. A = Unit demand for a year. Cp = Cost to place one order. The example above shows a reorder point of 500 units. When inventory falls to that level, the firm reorders. The objective is to order the optimal quantity—the order size that minimizes total relevant costs. The Economic order quantity (EOQ) for this purpose calculates from the formula in Exhibit 4 below. In conclusion, the firm should order 1,100 new units when the current inventory level drops to 500 units. Note, incidentally, that the example above finds the reorder point using a safety stock figure of 150 units. Here, the firm chose to order safety stock to cover an extra six days usage (at the current daily usage rate). Reorder point calculations include a safety stock figure to guard against the high cost of "stocking out" while waiting for new inventory to arrive. Finding the optimal safety stock level, however, requires accurate and detailed knowledge of the firm's operations and inventory needs. The buffer is safety stock added to guard against stock outage from statistical variation in daily usage. Fluctuations are due to normal statistical variability, seasonal cycles, and other factors. This term refers to inventory that allows different work centers or groups to operate independently. This term refers to safety stock that anticipates future demand or supply interruption. This term refers to extra safety stock, recognizing that inventory goods cannot move instantaneously. Just in time manufacturing (JIT) attempts to eliminate excess goods in stock. Firms using JIT order raw materials and parts only at the latest possible time—not until manufacturing demand calls for it. Under JIT, firms never order excess goods. Successful JIT manufacturing requires that the manufacturer and suppliers work together closely and request and receive inventory reliably on short notice. Consignment selling. Vendors who sell goods on consignment, such as Amazon.com, hold but do not own many of the products they sell. Sellers who successfully use "consignment" selling rely on their ability to forecast sales accurately. As a result, they order only the consignment goods they are confident of selling quickly. Successful consignment selling, therefore, is similar to just in time manufacturing in some ways. In both cases, accurate forecasting and fast re-supply are essential. Vendor-managed inventory is common in pharmacies and shops that sell healthcare products, for instance. The objective in VMI is to save the customer business the costs of ordering, holding excess, or dealing with "stocked out" situations. Vendors sometimes avoid the need to keep finished goods by arranging to have their own suppliers ship directly to their customers. Apple Computer, for example, uses this approach in selling computers and mobile phones for customers who shop online.